It’s never too early to start thinking about holiday gift shopping. 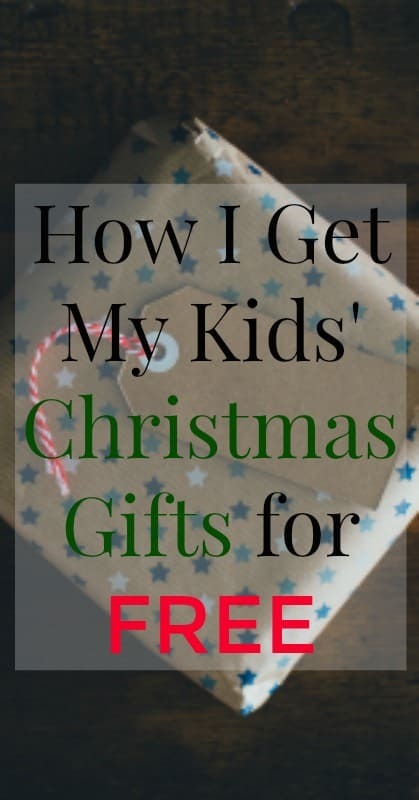 In fact, I plan way ahead to get my kids’ Christmas gifts for free. Fortunately, it’s easy to do and anyone who has a computer or smartphone, or grocery shops can do it. My secret to getting Christmas and birthday gifts for free is simple: I get paid to do things I already do – online surveys, online shopping, and grocery shopping. My computer, smartphone, and grocery lists help me earn money all year long. You probably have a ton of questions. Let’s see if I can answer some of them before I share the links you’ll need to make this happen. How do online survey sites work? Survey sites offer surveys that you take for a certain dollar amount or a certain number of points that translate into a dollar amount. Companies hire the survey site to send surveys to its users to ask them questions about their favorite products, their political views, their demographics, and more. I love survey sites because they allow me to share my extremely valuable opinion and get paid for it. That’s right. As consumers, and especially as “momsumers” our opinions are extremely valuable to companies and organizations. We have a lot of buying power and they want to make sure they are offering us what we truly want and that we are satisfied customers. How can I earn money while shopping? Easy-peasy. Companies enlist in the help of certain apps and websites to get customers in the door. They offer cash back on purchases if you shop in their store or online. Again, it’s a marketing strategy. Pay a customer to shop with you instead of your competitor. Offer the customer an incentive and share part of the sale with them. It’s a win-win for companies and consumers. Are there lots of hoops to jump through? I know what you’re thinking. To cash out at any of these survey or cash back sites you have to accumulate a large balance or only shop on every second Thursday, right? Nope. While I’m sure there are some trickier programs out there, the ones I’m sharing with you today require very little. Just sign up and start earning. Usually there is a $10-25 minimum balance before cashing out. Oh, and cash means CASH. Not store credit. Not gift cards (although some do offer gift cards if that’s your preference.) It’s usually cash paid directly into your bank account, your PayPal account, or put on a pre-paid Visa card that you can use anywhere. Recommended: 56 Free Homeschool Social Studies Resources - History, Geography, and More! What if I don’t like shopping online? I hear ya. I do a lot of online shopping, but I do most of my grocery shopping in the store. That’s why I was thrilled to find a that couple of the programs I’ll list below give you cash back on in-store purchases. Woohoo! What if I don’t have time to take surveys? I get it. We moms are busy folks. I don’t have time to spend hours each week answering surveys. That’s why I don’t sign up for every survey site online. I’ve narrowed my list down to three that give me the biggest returns for the least amount of time spent. Each time I discovered a new way to earn cash back, I went in with skepticism. There are many cash back and survey sites I’ve tried that I won’t mention here. They just didn’t work for me. They either required too much time and effort for the amount they were willing to pay or I didn’t enjoy using the sites. For example, I’ll never again watch videos or play games to earn a bit of pocket change. You’ll burnout quickly on websites like that and I think they count on it. If you stop using the site before you earn enough to cash out they still get to show their advertisers a pretty good ROI without paying you a cent. I don’t support that type of company at all. The websites and apps I’m sharing with you in this article have passed my skepticism and made me a believer. I’ve cashed out at least once with all of them and multiple times with most of them. If you’re ready to get started right now, here’s a quick list of my favorite sites for getting gift cards and cash via surveys, cash back and other means. For more info on my favorite survey and cash back websites, be sure to keep reading past the quick list. Read on for how each site works and why I recommend them. American Consumer Opinion offers points for surveys. Each point is equal to a penny. Most surveys give hundreds of points. Even if you don’t qualify for a full survey, you get still get some points for taking the screening survey. You can cash out when you’ve accumulated 1000 points. On the first day I signed up with Survey Junkie, I had the potential for hundreds of points worth of surveys waiting on me. I also received a couple hundred points for filling out my profile, confirming my email and other super easy tasks. You need 1000 points to cash out. 1000 points = $10. If you want to feel like your opinion makes a difference in political and social matters, you want to sign up for YouGov. I love their surveys – especially the ones about my political opinions. They offer hundreds of points per survey and you can cash out at various point levels. You can save up your points for a $100 cash out, which is what I’ve done. Who couldn’t use a couple hundred bucks just in time for Christmas? Or, you can cash out earlier for a gift card to your favorite restaurant or store (Amazon included). If you only have time for one survey site, choose YouGov. If you use my link you’ll get 2000 points credited to your account once you’ve filled out four surveys. I usually get 1-2 surveys per week, plus other opportunities to give an quick opinion for points. Dosh is my new favorite cash back app. I just got 10% back on my Sam’s Club purchase yesterday, in fact. Score! The best thing about Dosh is that you don’t have to keep your receipt and take pictures of barcodes to get credit. You just link your credit or debit cards, shop like you usually do, and smile when you get the notification that more money has been deposited into your account. The cash out threshold is $25 and there has never been a waiting period. In fact, my purchase yesterday pushed me over the threshold and I cashed out when I got home. You can also shop online for more cash back with Dosh. I can’t say enough positive things about my experience with Dosh. You can also shop online for more cash back with iBotta. Download the iBotta app, save your receipts and snap a pic of the product and your receipt and you can get cash. For example, this week I can get $3 for buying honey, produce, and tuna at my grocery store. Those are things on my list anyway, so I’m literally getting paid to shop. My favorite thing about iBotta is the offers that allow you to buy any brand – even generic – of an item or offer cash back on fruits and veggies. There’s even usually a “buy any item” offer. That’s right – cash back on any item. Sign up with my link and get a $10 bonus. Ebates does what sounds like it does. When you shop, Ebates offers you cash back for your purchases. Before shopping online, see if you will get cash back through Ebates. Link your debit or credit cards and get cash back on in-store purchases, as well. TopCashBack is one of my favorite deal sites for moms. TopCashBack offers deals from major retailers and gives you cash back when you take advantage of the deals. For example, there was a lovely Finding Dory backpack and lunchbox set from Kohl’s earlier this week that was $14.99. TopCashBack offered $14.99 (that’s right – the full amount) back to members who took advantage of the deal. Even if none of the above cash earning options appeal to you (or if they do, but you’re looking for an additional way to save for the holidays), this one will probably pique your interest. Acorns helps you save money by rounding your purchases up to the next dollar. And by purchases, I mean any amount that is deducted from your linked bank accounts or credit/debit cards. For example, if you spend $50.25 on groceries, $.75 is rolled right into your Acorns account. If you pay your electric bill for $100.00, $1.00 is rolled into your Acorns account. You can pause roll ups at any time, as well, so no worries there. Now, Acorns does have a earned-money component. Some companies, for example, Sam’s Club, will put money in your Acorns account when you shop with them. I get a $1.00 in my Acorns account when I shop with Sam’s Club and Old Navy, for instance. There are other companies who do the same. You can keep the money in your Acorns account for as long as you want or cash it out at any time. Since Acorns works as an investment account, your money keeps making money if you leave it in the account. This is the perfect no-stress way to save for the holidays. You’d be surprised just how fast these round ups add up. The money in my Acorns account more than pays for the boys’ birthdays each year. With a little bit of help from the internet, you can have your kids Christmas and birthdays paid for each year. Or, use the cash and gift cards for paying bills or getting yourself something nice.